We thank you for your interest in receiving a complimentary issue of ideal-LIVING Magazine! ideal-LIVING magazine is a quarterly publication that helps retirees find their ideal life. Ideal-LIVING features top places to retire and articles on healthy living, green products, home building and lifestyle. 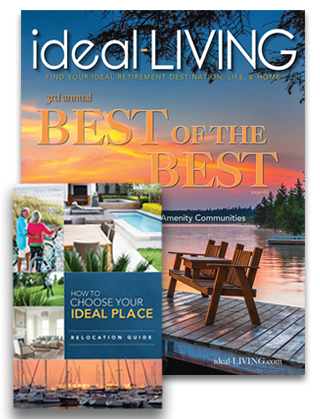 ideal-LIVING magazine is a quarterly publication that helps retirees find their ideal life. Our magazine showcases the top places to retire, as well as articles on healthy living, green products, home building and lifestyle. If your dream is to retire with more space, higher temperatures & lower taxes, ideal-LIVING can help get you there. Be sure to check out the online archives of ideal-LIVING Magazine going back to 2009 allowing allows reader to search past covers, articles and entire ideal-LIVING back issues. Our next digital Issue of ideal-LIVING magazine will be for most popular tablets this Spring! Try searching our Communities database, loaded with comprehensive criteria on over 250 communities in the most desirable retirement areas. Ideal-LIVING.com is the one-stop site for retirement data. You may already feel familiar with the communities you have chosen, but with a Discovery Tour you can take it one step farther. A Tours can to introduce you to the lifestyle offered by the community, and are designed for people who are actively looking for a destination and nearing the time for decision. Add contact@ideal-LIVING.com to your address book or safe sender list. Disclaimer: The opinions expressed here are those of the sponsors and are not an endorsement nor do they reflect the opinions of RPI Media Inc. or any of its publications. RPI Media believes strongly in protecting your privacy. The information that you provide to us will only be used as set forth herein.